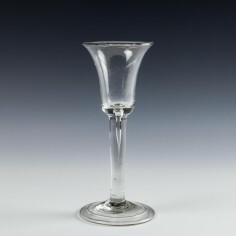 Georgian plain stem wine and other drinking glasses are the most common of all 18th century period forms but are not to be frowned upon. We have some clients who avidly collect only plain stem wine, gin and cordial glasses as they benefit from a far wider range of bowl type, engraving, applied decoration and foot type than any other form. 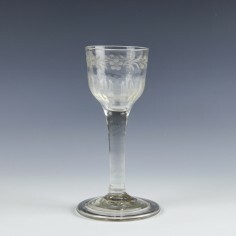 The thickened firing foot, terraced and over-sewn or over strung foot, folded and flanged foot and early tavern gin glasses are most commonly found on plan stems. 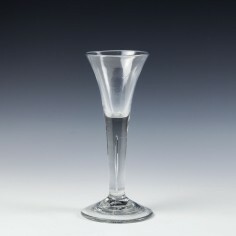 There is incredible diversity within the size of drawn trumpet bowl glasses alone, from the 12 ¾ inch tall goliath to the dram glasses that are but a quarter of the height. The thin-stemmed toasting glasses are amongst the most delightful of all to use on that special occasion. 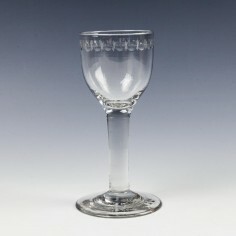 Lynn moulding is most commonly found on the bowls plain stems glasses and it is no coincidence that the Amen glasses and true Jacobite glasses are of plain stem form. 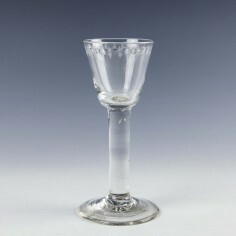 A Beilby enamelled plain stem glass is a true rarity, as are those gilded by the James Giles atelier. 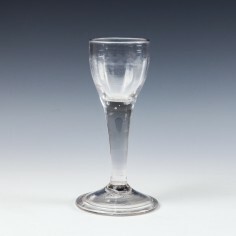 The two-piece drawn trumpet glass - it may be argued - is the definitive and most iconic of glasses from the Georgian and Regency periods. A Georgian plain stem wine glass that can be found on our on-line store at Scottish Antiques. 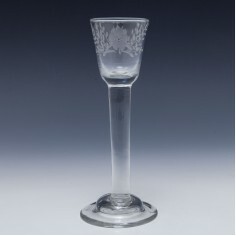 An elegant example of an English Georgian plain stemmed and engraved wine glass which can be found on our on-line store at Scottish Antiques.